This is the last week of the Virtual Curriculum Fair for 2016 and the topic this week is the arts. I have probably mentioned that art is not one of the things that we do exceptionally well in our homeschool. It’s not that I don’t think it’s important, it’s just one of those things that gets pushed aside. I’ve been using this time to look back over the last 13 years of homeschooling and talk about what we did right and what we’d do differently this time. David actually did a lot of art on his own, he was always drawing when he was younger and we supplied him with many books on art and plenty of supplies. Most of his talent for drawing is now used in his work on computer graphics. Music for David was another story. When he was 5 he asked for a piano for Christmas. That wasn’t a feasible gift at the time, so we bought him a small keyboard. Not too long after that we were able to move my parent’s piano to our house. Unfortunately, we weren’t able to pay for lessons for David at that time so I tried to teach him piano. It is difficult to teach piano to your own perfectionist child. Or at least it was for me since I was already teaching him everything else. So his formal training in piano was very short-lived. We offered to get him piano lessons a few years later, but he wasn’t interested. That is something that I regret. I wish there had been some way to get him lessons when he asked for them or that I had insisted that he try at least a few later when we offered them. The other children have all had music lessons. Anna plays the violin and in addition to lessons this year, she has joined a youth orchestra. She helps teach Lizzie violin. William takes piano lessons. Playing piano, especially at recitals, has been very helpful in building his confidence. His teacher has just begun teaching Lizzie piano as well. So with all the practicing going on here, it’s not uncommon to hear the Sounds of Music in our house! This is the final week of this year’s Virtual Curriculum Fair. Visit these other great blogs to see how they teach art and add beauty to their homeschools. Lisa@ Golden Grasses – What Are We Fighting For? This week’s topic for the Virtual Curriculum Fair is Seeking Beauty: The Arts. Our hosts areSusan @ Homeschooling Hearts & Minds and Lisa @ Golden Grasses. Even though I’ve participated in the Virtual Curriculum Fair for several years, I have never written on this topic. The simple reason is that I have never felt like I had much to share because our schedule is usually missing art. I still don’t think that I have a lot to offer on this topic. It’s not that I don’t have good intentions. I’ve even purchased lots of fantastic resources for studying art. I honestly don’t know why I keep holding on to all those books. I guess I keep hoping that I’ll make the time to use them with my younger children. Since, my oldest son was very interested in drawing when he has younger, we also collected many other drawing books at that time. We have books at various levels on drawing animals, drawing people, drawing cartoons, drawing buildings, etc. And rather than using a curriculum regularly, what my younger kids tend to do is pull out one of those specific books and see how to draw whatever they’re interested in drawing at the moment. But if one of them expresses at interest in regular drawing lessons, I guess I’m prepared. And while I had grand ideas of studying great artists as we were studying their time in history, that has also never happened. Once again, I do have a couple of good books on famous works of art that are child appropriate. I like the concept of a book basket. (I believe it’s from My Father’s World, though I’ve never used that curriculum). I’ve never fully implemented the book basket idea, but especially for art study, I think it’s a great idea. The idea is to have a rotating collection of books (from the library or personal shelves) that are put into a specific place (like a basket) for children to choose from during a specific time. Music is an area that we’ve done better at studying consistently, but only because 2 of the children take music lessons. Anna has taken violin for 5 years and William takes piano. David learned the basics of piano from me when he was younger. At that time, we couldn’t afford outside lessons, so he didn’t get as far as I would like because music lessons at home were difficult for us. Music lessons are definitely something that can be hard to fit into the budget, but they are so worth it for the child that is interested in learning. There are ways to save on lessons. For example, there may be an advanced student who would be willing to teach a beginning student. Or there may be a homeschool mom you could barter with for lessons. You could tutor math in exchange for music lessons. Music is easier than art to incorporate into the typical day. One simple way is to have classical music playing as background music. Anna, my 15 year old, has classical music playing in her room most of the time. Another easy way to add music is to listen in the car. When you’re driving you have a captive audience. Another option that I’m considering for Anna is the Easy Peasy Music Appreciation course for high school. I love how it’s so clearly laid out with daily lessons. I also love that it’s free! Hopefully you’ve found some ideas for adding a small amount of beauty into your homeschool days. I’d love to hear how you teach art or music. 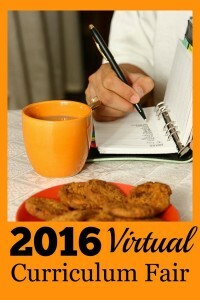 Don’t miss the other posts in this week’s Virtual Curriculum Fair. It’s summer. We don’t have to do school, right? Maybe not officially, but I like to make sure we’re still learning. Recently, I’ve had a great opportunity to sneak a little history into my family’s day. I don’t know if your kids are like mine, but I cannot watch a video or play any song on my computer without everybody running to see what I’m watching or listening to. It can be annoying, but it does have its uses – like if you want them to watch or listen to something. It’s the perfect way to introduce the music portion of Experience History Through Music to unsuspecting children. Another sneaky thing I like to do is leave interesting books lying around. Especially if they have an interesting cover and photographs on the inside. The saying about not judging a book by its cover is good advice, but a good cover is definitely a plus. That’s how I got my 14 year old daughter to read Musical Memories of Laura Ingalls Wilder from cover to cover without even asking her to. It’s also why I’ve seen my 12 year old son flipping through the books and reading sections from time to time. That works until they disappear into my daughter’s room so she can try out some of the songs on her violin. I love the format of these books. Each contain a 1-2 page illustrated spread that tells the story behind a song. These stories typically give both specifics about the history of the song, and a more general description of the events in history that the song pertains to. The short length of each segment makes it easy to either very quickly read a small portion, or as time allows, to continue reading multiple sections. I also love that the books include simple sheet music for the songs. In our home, my older daughter plays the violin, and my middle son plays the piano. Both are able to (fairly) easily play the music in these books. The accompanying music cd’s are professional, high quality recordings. They are a vitally important part of this study. It seems pointless to study about a song without listening to it! We honestly don’t listen to a lot of music in the house, but these are going to have a rotation in the car once we start back to school with all the short trips we make to classes, lessons, etc. America – Heart of a New Nation includes many familiar songs like Yankee Doodle, the Star Spangled Banner, and Oh! Susanna. It focuses on the time period beginning at the American Revolution through the Civil War. Westward Ho! has some overlap in time period with America – Heart of a New Nation, but its focus is on songs related to westward expansion like the Oregon Trail, cattle drives, and even sailing songs (Before the railroad, many goods were transported west by sailing around South America). I wasn’t familiar with any of the songs in this volume except for Home on the Range. Musical Memories of Laura Ingalls Wilder also overlaps the Westward Ho! time period, but it details specific songs and facts related to the life of Laura Ingalls Wilder. I enjoyed reading all these books, but especially Musical Memories of Laura Ingalls Wilder. I have loved everything Little House on the Prairie since childhood and have a collection of various books and videos about Laura Ingalls Wilder. I have also visited the Laura Ingalls Wilder Museum in Mansfield, Missouri and hope to visit some of the other home sites and museums in the future. These books would make a fantastic addition to any homeschooler’s library. They could be used to supplement any American History curriculum, as stand-alone unit study spines, or as inviting coffee table books. The books are $18.99 each and are available at from DianaWaring.com. 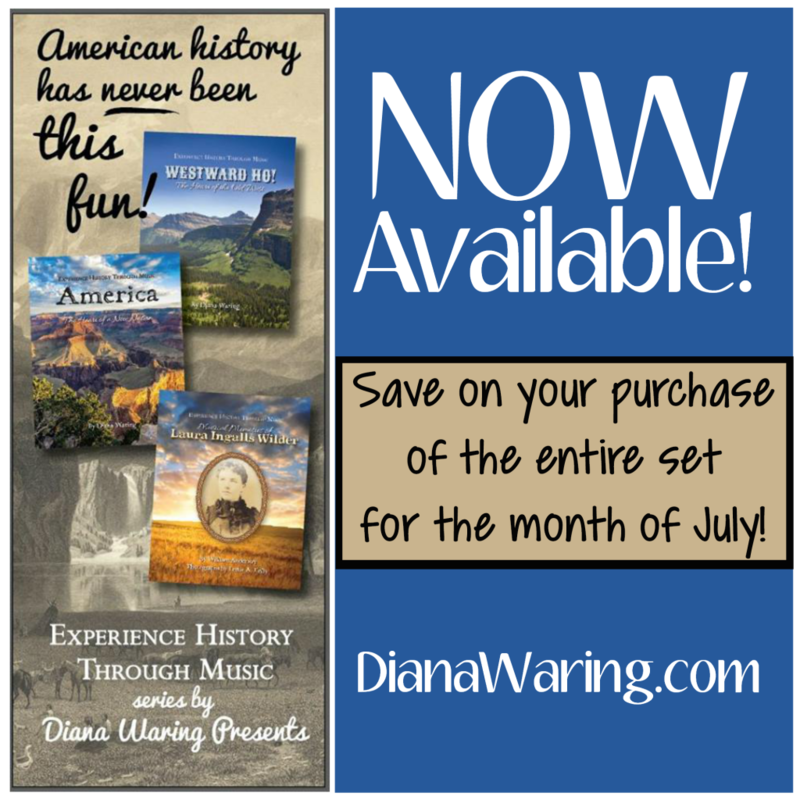 For the month of July, you can purchase all 3 books for $50. Don’t miss this fantastic giveaway to celebrate the release of Experience History Through Music. It ends tomorrow! 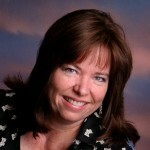 Author of Beyond Survival, Reaping the Harvest and Diana Waring’s History Revealed world history curriculum, Diana discovered years ago that “the key to education is relationship.” Beginning in the early ’80s, Diana homeschooled her children through high-school—the real life opportunities to learn how kids learn. Mentored by educators whose focus was honoring Him who created all learners, and with an international background (born in Germany, university degree in French, lifelong student of world history), Diana cares about how people learn as well as what they learn. Audiences on four continents have enthusiastically received her energetic speaking style. Disclaimer: I received the complete set of Experience History Through Music in order to write this review. I was not compensated for this review. All opinions expressed are my own. I have a little confession. I know next to nothing about studying art and music. Pathetically little. I’d like to remedy that, and it’s something I hope my children never say. Charlotte Mason suggests very simple ways for adding in picture study and classical music to your days. They are simple, but to someone with no knowledge at all, it’s hard to know where to start. What artist do you study? What did he paint anyway? With research, I could probably put something together. But that research just never seems to happen. And consequently neither does art and music study. 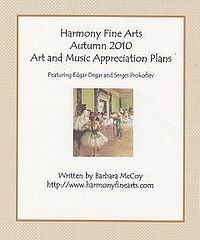 That’s why I jumped at the chance to review Harmony Fine Arts Autumn 2010 Art and Music Appreciation Plans. I should mention that even though Autumn is in the title, these plans are not seasonal and can be used at any time of the year. 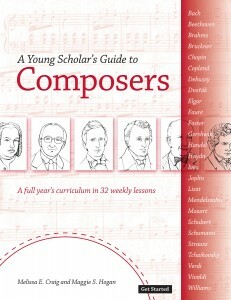 This e-book features plans for studying the art of Edgar Degas and the music of Sergei Prokofiev. Included are suggested paintings and musical pieces to study. Copies of the paintings themselves are included to print or view on the computer. In addition there are links to listen to the music on-line and suggested downloads. But this e-book doesn’t just tell you what to study, it provides plans of how to study it and in what order, along with optional additional activities. There are original notebook pages for both the composer and artist studies, as well as coloring pages for several of the studied paintings. The e-book is nicely organized and is easy to navigate with internal links. Now is where I’m tempted to sound like a cheesy infomercial. How much would you expect to pay for all of this? I’ll try to resist the urge to continue. Seriously, this book is available for $3.25! I know we all have different ideas of what we consider “expensive”, but $3.25 is a real bargain. Even if you know enough to put this all together yourself, it’s worth $3.25 to save your time. And if you’re like me and don’t want to spend a lot of money on something you’re not sure you’ll find the time to do, then this is a very small risk. You can purchase this e-book here on the Harmony Art Mom blog. You can also view a sample of the book at the same link. If you’re interested in studying art and music appreciation with your children, I urge you to visit Harmony Art Mom and look at this and her other resources. Disclosure: I received a free copy of this e-book in order to write this review. The opinions expressed are my own.